Presented as a basic wrist strap, this is a daily monitor that measures both UV A and UV B from the environment. It features the ability to set your skin type, and by means of LEDs, lets you know how much time you have spent in the sun (or in exposure to UV), and warns you when you have had too much. With the summer we have just had in England, devices such as these are quite important. From people looking like lobsters, to generally caring for your skin and yourself, there are many reasons to have one on your wrist. Battery operated, which promises to run a year at least. No need to pair with any phone, etc. Simple LED interface, with simple buttons to do what you want. Waterproof up to 3 meters. 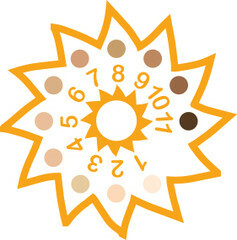 Lets you know when you have had too much sun, or you can press the ‘CHECK UVA + B’ button to know how you’re doing. Lets you adjust for your skin type. Wrist strap based design, meaning it is easy to wear. Light, and comes in a range of colours. A light weight, small and easy package to have around your wrist. Wrist strap is fairly comfortable, and it is easy to wear. The LEDs are bright enough to be used outdoors, which is quite handy. Quite an easy device to use, considering the importance. Power it on when you’re going out in the sun. Set your skin type. 1 for lightest, 11 for darkest. Off you go. Keep it on, keep checking it if you’re in the sun, and when it hits 11, go find a shade, put some clothes on, or whatever suits you best. You can always check the level by pressing a button, but when it hits 11, it starts to flash, letting you know to get out of the sun. So, do I put another coating of sunblock on? Oh no. This product is actually designed to run void of sun block. So you can actually use this out in the sun, without needing any sun block. Your time may be limited, but at least you can be out and about without needing any sun block. Can I use this in combination with sun block? Of course you can. However, different sun blocks have different characteristics, and it is just not designed to work like that. Use this, but definitely think about investing in some sun block as well. I like it, how can I get it? It is also available at online retailers, such as Amazon. It costs $49.99 in US Dollars. A handy device to have with you, light, convenient, and very useful. Don’t go out without one! Next story Do casinos keep my personal info safe?